By way of introducing the musical guest (Prince) at the 15th anniversary episode of Saturday Night Live in 1989, model/actress Jerry Hall said the show has a tendency to book bands long before we've heard of them or long after we've heard of them. Which is what puts the ironic twist on this year's Grammy Awards. 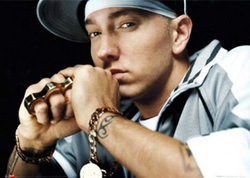 In 2001, the very relevant, calculately controversial rapper Eminem had a smash hit with his The Marshall Mathers LP and seemed poised to be anointed by the industry. Instead, 1970's heavyweights Steely Dan took home the Album of the Year award for their comeback album Two Against Nature—their first Grammy gold, after inexplicably failing to win while making a string of the most accomplished pop albums around…25 years prior. This year, somehow, Eminem is the wizened, respected veteran with a chance at sweeping the major awards. He has 11 past Grammys on the shelf, but the major, cross-genre awards have eluded him; all wins save one (a 2002 prize for short form video) are for performances in rap categories. He leads this year's nominees with 10 nods, including berths in the Album of the Year (for Recovery), Record of the Year and Song of the Year categories (both for "Love the Way You Lie"). In 2001, Eminem punctuated his much-anticipated duet with Elton John by flipping the bird at the audience. If he wins the big prizes this year, somehow I don't expect a tear-choked list of "thank yous." After glamming her way through an excellent medley (including a duet with the ubiquitous Elton) to open last year’s broadcast, Gaga’s biggest moment this year—and potentially the highlight of the broadcast—may be the live debut of new single (out today), “Born This Way.” Lady Antebellum (Need You Now) and Katy Perry (Teenage Dream) round out the nominees in the Album of the Year category; either would be a real dark horse victor. The cards are stacked for the unlikely stamp of mainstream approval for the once-controversial, once-threatening Eminem. Many are picking newly christened New York anthem “Empire State of Mind” by Jay-Z and Alicia Keys to take home Record of the Year honors. In addition to Eminem’s entry, the competition includes "Nothin' on You" by B.o.B (featuring Bruno Mars), Lady Antebellum’s "Need You Now" and the euphemistically-abbreviated-for-print-purposes “F*** You” by Cee Lo Green. (As performed, the song has no asterisks.) Song of the Year (awarded to the songwriter) features four of the above, with B.o.B. and Jay Z/Alicia Keys songs replaced by Ray LaMontagne’s "Beg Steal or Borrow" and Miranda Lambert’s "The House That Built Me." The award show itself has changed quite a bit in recent years, with a heightened emphasis on live performance—particularly, counter-intuitive duet and combinations of artists who haven’t necessarily worked together before. (See: Eminem and Elton.) The announcement of many nominations has even switched from the traditional pre-dawn press conference to a live concert event. The chosen venue of late is Los Angeles’s Staples Center, much more capable of simulating a concert experience than the auditoriums and theaters of old. Of the more than 100 Grammys awarded last year, only nine were actually presented during the telecast, making room for superstar medleys, cover versions, and pyrotechnics. Most of the time, it was like watching a demented cross between the Super Bowl halftime show and The Last Waltz. The lineup of performers this year is particularly stacked, with high-profile artists continuing to be added to the lineup this week. In their 50 years together The Rolling Stones have never performed at the Grammys, but this year Mick Jagger will take center stage (for a change) in a tribute to influential soul singer Solomon Burke. A tribute to soul queen Aretha Franklin, just announced on Wednesday, will feature a bevy of golden-piped songstresses, including Christina Aguilera, Jennifer Hudson, Martina McBride, Yolanda Adams and Florence Welch. Another late-announced performer is Barbara Streisand, who rarely performs publicly. She’s a nominee this year (for Best Traditional Pop Vocal Album), but this really fits in the special appearance category, given her habit of shunning the stage. The strangest juxtaposition of the night may be Cee-Lo Green, who is collaborating with actress Gwyneth Paltrow and an as-yet-unidentified chorus of Muppets. (Expect a potentially hilarious spin on Cee-Lo’s naughty-word hit.) Other nominees slated to perform include Eminem, Drake and Rihanna (nominated separately but performing together), Katy Perry, Arcade Fire, and Miranda Lambert, the latter two making their live Grammy debuts. If the annual Grammy broadcast is shifting toward an all-star concert spiced with the occasional award presentation, it may make for a slicker package but it eradicates the pleasure of seeing the genuine thrill experienced by winners of lesser-profile awards, and the chance for the unexpected. Yet, there is no other time you’ll see Eminem, Mick Jagger, Barbara Streisand and the Muppets on the same stage in rapid succession. It may make for a less than satisfying awards presentation, but it’s a heck of a circus.